Vendors say “we will meet at 2018 elections”. Home Hurukuro Nema Vendors Vendors Vendors say “we will meet at 2018 elections”. There was mayhem in Harare’s central business district (CBD) yesterday as vendors resisted eviction by Zanu PF-aligned informal traders’ organisations and municipal police warning that “we will meet at 2018 elections”. The evictions followed a government directive to flush out all unregistered vendors selling their wares on street pavements across the country. The clean-up operation targeted informal traders who were operating from undesignated selling points. Angry vendors, most of them members of an association with strong links to Zanu PF known as Grassroots Empowerment Association, did not only trade blows, but also turned their anger on President Robert Mugabe’s government by threatening to sabotage it in the 2018 general elections. Vendors hold up a banner while demonstrating against their removal from undesignated selling sites in Harare’s central business district on June 8. The drama started in the morning when council police demolished stalls on pavements close to Copacabana bus terminus and the footbridge across Julius Nyerere Way near Town House. They then ordered vendors to move to designated places mostly at the holding bays outside the CBD. But the pro-Zanu PF vendors marched towards a fruit market at the designated Copacabana market where they tried to “evict” those who had placed their wares, marking the beginning of a serious fight. A female vendor, in protecting her wares and space, began assaulting a male colleague. Others joined in the fight hurling various objects at each other as they resisted moving out to give way to the “new registered invaders”. When NewsDay arrived at the scene, tables and stones were being turned upside down and flying back and forth with some of the vendors insulting others using obscene language. They vowed never to leave their workstations. The situation threatened to get out of hand until riot police intervened. A man walks past demolished stalls belonging to vendors along Speke Avenue on June 8. But council spokesperson Michael Chideme downplayed the melee saying it was an administrative issue that was being sorted out. “These people who are making noise are space barons who feel threatened,” he said. 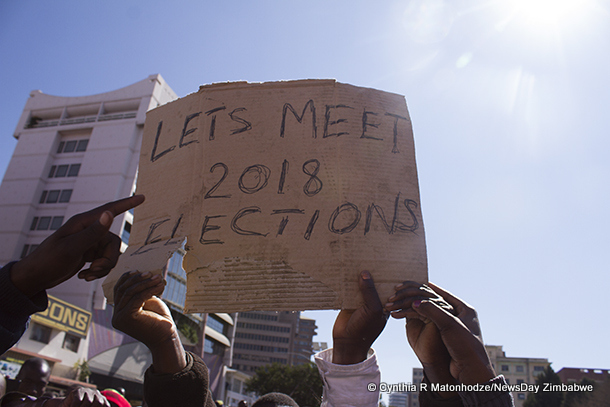 The placard-waving vendors, most of whom claimed to be aligned to the ruling Zanu PF party, demanded that newly-appointed Local Government minister Saviour Kasukuwere should address them. They warned Zanu PF they would withhold their vote in the 2018 elections and demanded answers on why only two days after Kasukuwere’s appointment they were being thrown out of the streets where they were eking out a living through vending in the absence of formal employment. “They allowed us in the streets saying it was empowerment as there are no jobs, is this their way of saying thank you?” one vendor operating from a tent belonging to Grassroots Empowerment Trust said. What was left of the area around the footbridge at Town House after vendors were removed this morning. During the 2013 election campaign, President Robert Mugabe and his party promised to create two million jobs, but three years on, the economy is on a free-fall, companies are closing down and millions have lost jobs instead. Mugabe’s wife Frist Lady Grace last year blasted the police for moving vendors out of the streets during her nationwide rallies that saw her plotting former Vice-President Joice Mujuru’s eventual downfall. Last year First Lady Grace Mugabe blasted the police for moving vendors out of the streets during her nationwide rallies that saw her plotting former Vice-President Joice Mujuru’s eventual downfall. Grace’s solidarity with the vendors triggered a massive influx of vendors in the streets until last month when government, through former Local Government minister Ignatius Chombo, announced that they would deploy the military to clean up the cities. Vendors on Wednesday had no kind words for government, querying why Zanu PF was being “vindictive” to informal traders trying to make an honest living. They said instead of creating jobs as promised, the government was busy planning to “condemn its people to destitution”. Vendors protest their removal along Speke Avenue. This followed reports that recently, Cabinet, chaired by Mugabe, agreed to push vendors out of the city centre to designated places. However, there was confusion as council has not provided adequate vending malls for more than 7 000 registered vendors to be relocated. Later in the day, thousands of vendors converged at the Anglican Cathedral in the city where they vowed to resist any attempts by the government or council to push them out of the streets. The vendors were back in the streets by close of business. The National Vendors’ Union of Zimbabwe (Navuz) organised the meeting attended by hundreds of vendors at the Cathedral. National Vendors Union of Zimbabwe chairperson Sten Zvorwadza addresses vendors during a public meeting at the Catholic Cathedral Church hall on June 8. Navuz chairperson Stendrick Zvorwadza advised vendors to continue selling their wares in the CBD in order to sustain their lives. “If you are selling anything on the streets you are going nowhere,” he said. He also threatened to engage the international community if the government used violence to drive out vendors. Vendors cheer as Zvorwadza speaks. “If any of you has a gun pointed at them or handcuffed you should come with the evidence to me. I am now capable of going to the United Nations without an appointment, I will go and report,” Zvorwadza said. A woman listens during Navuz chaiperson Sten Zvorwadza’s address at the Catholic Cathedral Church hall on June 8. He said other vendors who had agreed to move out of the CBD were free to occupy the dusty designated areas which were less profitable. The meeting was attended by other stakeholders’ representatives including Zimbabwe Informal Sectors’ Organisation and the Zimbabwe National Students Union, who have declared solidarity with the vendors.